This is a first, a domestic pet as a thatched animal! 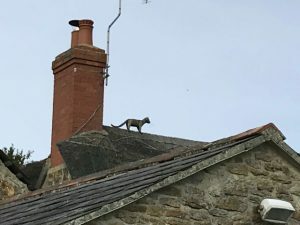 I saw this thatched animal on a roof in Abbotsbury when I was on holiday earlier in the year in Dorset. I can’t say I have ever seen any other domestic pets as thatched animals. So as here, the choice of thatched animal that appears on any roof must be purely down to the personal taste of the owners. Unfortunately I didn’t see any other examples of thatched animals as pets whilst I was on my Dorset holiday! I had a very relaxing break though with lots of walking.